The scalp of a horrid cleric beast, indicating that hunter Brador, a Healing Church assassin, had killed a compatriot. Afterward, he wore his ally's own scalp, and hid himself away, deep below in a cell. The Church provided him with a single, soundless bell of death, to ensure their secrets would be kept. 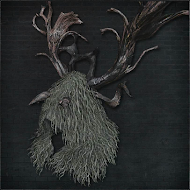 The bloodied hide of a horrible cleric beast, pulled over the back. Without the attacked beast hide this foreigner garb wouldn't raise anyone's eyebrows. Brador donned a compatriot's beastly scalp and hide while still moist with blood. Most of the blood stains on this hide were from that day. Bloodied arm bands. Brador donned a compatriot's beastly scalp and hide while still moist with blood. Most of the blood stains on this hide were from that day. Bloodied foreign trousers. Brador donned a compatriot's beastly scalp and hide while still moist with blood. Most of the blood stains on this hide were from that day. Brador's Set has the highest Beasthood of all armor sets. Brador's Testimony has the highest Beasthood of all head pieces. 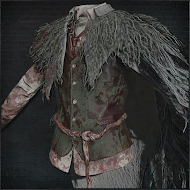 Beast Hide Garb has one of the highest Physical and Blunt defense of all chest pieces. 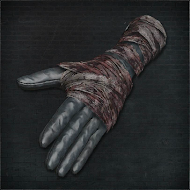 Bloodied Arm Bands has the highest Beasthood of all Hand pieces. 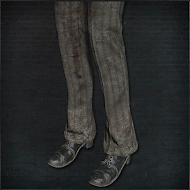 Bloodied Trousers has the highest Beasthood of all Leg pieces. W is Physical defense, has two special subtypes: blunt and thrust. Each physical attack is either normal physical, blunt, or thrust. X is Slow Poison resistance to slow poisoning. The higher this attribute, the more resistant you are. Y is Rapid Poison resistance to rapid poisoning. The higher this attribute, the more resistant you are. Z is Frenzy resistance to the lure of frenzy. The higher this attribute, the more resistant you are.